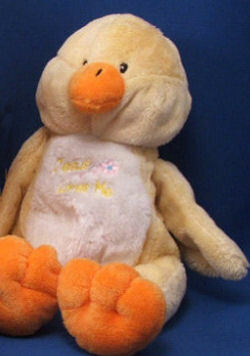 I’m looking for a Baby Connection yellow and white duck embroidered JESUS LOVES ME on his tummy. It has an orange bill and feet, and it plays the song when you squeeze the wing. We originally purchased this at a garage sale before my granddaughter was born. She is now almost 20 months, and we have taught her the song, which she is almost able to sing. Recently it stopped working, and we did surgery and changed the battery, but it still will not work. We would really like to find another. Here is one much more reasonable. ebay #160598038289 even on “sale” currently. Thinking you may no longer be looking. Let us know how things stand. ebay #	110575530801 Best Wishes!